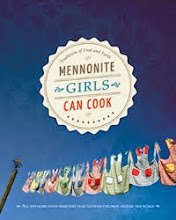 2013 certainly has been a year of celebrating here at Mennonite Girls Can Cook. 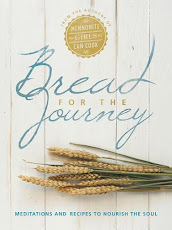 We waited with great anticipation for the launch of our second cookbook called Celebrations this past spring, and we have been kept busy with different events. It's always so interesting for us to hear stories from those who have given or received one of our books. With Christmas just around the corner you may already be looking for gift ideas. 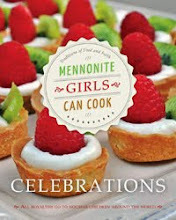 In our first book Mennonite Girls Can Cook you will find many of our Mennonite heritage recipes along with our personal stories and inspirational thoughts. In our second book Celebrations we chose recipes that would be suitable for 10 different celebrations in life. Most of the recipes in this book are not from our heritage collection, but are our personal family favourites we have served for family dinners to holiday dinner parties. Again we added our stories and inspirations in this volume along with more beautiful photography, making this not only a cookbook, but a coffee table book. Here is a sneak peek into the pages of Celebrations. Here is the link to find your local retailer who carry both of our cookbooks. You can also order both books from amazon.ca and amazon.com. Every time a book is purchased you are also helping those in need. 100% of our royalties always goes to one of our projects. I'm so happy to have both books! I make 'skinny' (German) pancakes for my kids all the time, and use the books as much as I can. Reminds me of growing up wih my grandmas cooking, and making almost everything from scratch makes me happy.